An important part of my practice is the combination of the black and the darkness. The darkness is my way of explaining mental health – particularly my own mental health. I guess more specifically, my depression. Being in the deepest, darkest and loneliest pits of depression is a place that can be hard to get out of. A place where it seems like there’s no escape and for a lot of people there isn’t a way of coming back and sadly is the end for some people. But for others, it isn’t the end and once they are out of this place they are a lot stronger for it. And for me, of course I still have my issues but I’m not down there anymore – well for the time being at least. I guess a frustrating thing about depression is that it never truly goes away. Yes, you can get better but often it returns in bouts. But within those bouts of darkness is also bouts of light. Without those bouts of darkness, you cannot appreciate the light. I go through stages, daily, of sadness and content and positivity and feeling of lonely but the difference is now that I can handle it better than before. And it is from remembering and experiencing these feelings both in the past and now as a daily routine that I try to channel into my practice. In short, the reason why most of my work is black is symbolic of the darkness which in return is symbolic of the mental health problems I suffer from. However, this isn’t necessarily a new train of thought. Hippocrates, the Greek physician had a theory. He believed that depression and other illnesses (both mental and physical) was merely an imbalance of bodily fluids, or in his terms – humors. He categorised these into four groups; yellow bile, phlegm, blood and black bile. He believed that depression was caused by an excessive amount of black bile. Its important to note that the colour he’s talking about is black. Black. It seems that throughout human existence, black has always been associated with the darkness, both metaphorically and physically. It accurately represents the idea of losing interest, losing hope and losing the will to live. It is the understanding that the darkness is all consuming, paralysing and indefinitely overwhelming. I wanted these works to be a continuation of my practice and my obsession with the darkness – which I think came across successfully to the audience. 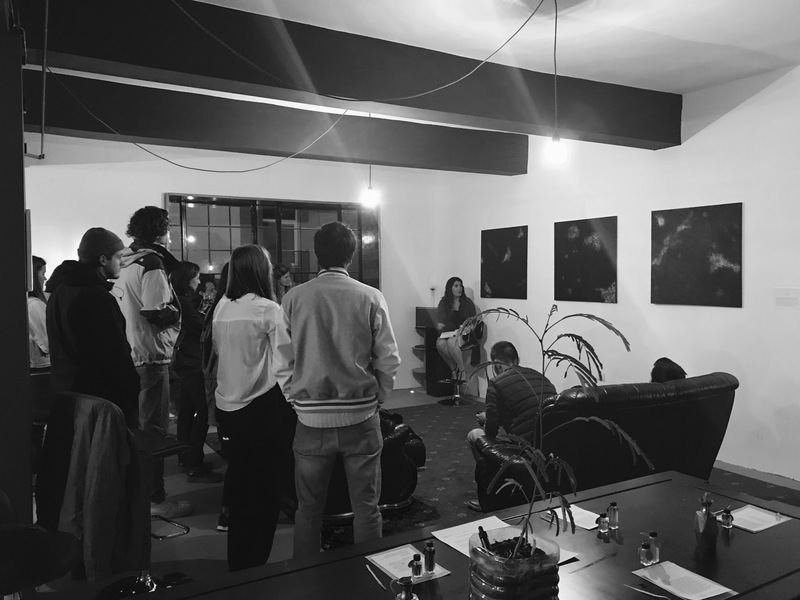 We held a one night only exhibition with artist talks consisting of me and the other artist in residence who was also as trained painter but was interested in perfume. Our work was very different but also worked very well together on a personal level. An equally important part of my work is the process that I quickly mentioned. For me, the process is a really important part of any work – sometimes a part that is disregarded. Perhaps because sometimes it isn’t visible but this is important. It is a fundamental element of my practice. Just because you cannot see something, doesn’t mean that it isn’t there. It doesn’t make it any less important because it isn’t initially visible. Because you see, if it wasn’t for the process there wouldn’t be any outcome at all. This is something that marries in mental health. Often, society disregard mental health as a real illness or disorder – simply because they are not always easy to spot or see within an individual. People say “Why don’t you just get over it?”. But if it were that easy then why would depression and anxiety be a leading cause of death within our world? Why would there be so many suicides? Why would people take their own live because they cannot live on this world anymore because every day it causes them unbearable pain that is unexplainable to anyone who asks? Its not something one can just get over and forget. It is so much more complex than that. In my paintings, this is a core component. Not everything is necessarily visible at first to the viewer. You may have to work to see it. You may not see it at all. You may feel overcome with emotion because you know what it’s like to be lost in the darkness. Physically because they take such a long time in making that it causes physical ailments. Because each stroke has a right of its own, it takes time – repetitively doing the same mark over and over again to fill a whole canvas isn’t done in a short time therefore standing in the same position doing the same movement over and over again cause physical pain and physical strain on my back, my legs even my head from concentrating so long. It is physically labouring. As I have previously mentioned, it can be both calming and upsetting due to the repetitive nature of the marks. It is a process that comes naturally, that I don’t have to think about sometimes. It just happens. It allows room for other thoughts but it also allows room for me to escape from this world. The painting almost acts as a therapy. A place allowing the darkness to manifest as settling the darkness. There is always a conflict with the darkness and the light. It feels to me as if it is a relationship as old as time. Something that has always been there and always will for as long as humans exist. Within these works specifically I noticed the conflict mentioned. It is demonstrated through the different speeds of painting. It all takes time for sure, but there is a slight difference in speeds between the black and the white. The black has taken longer, perhaps a signal that the darkness lingers. It lurks as if a giant cloud is following ones being. But the white, in this case, is faster. It is erratic. It is an argument within oneself. But what is the argument? It is the thoughts talking over one another, fighting to be heard, fighting to escape and let loose to all things consuming. Often I struggle between my different disorders. They contradict one another and talk over one another which is what makes it hard. What one should I listen to? Do I listen to any? It seems like they are always fighting. There is never peace. There is never silence. The silence only comes whilst I am creating. My practice acts as a sort of therapy for myself and my inner demons. It is a place where I can go to escape the utterly overwhelming realm that is the darkness.